While U.S. citizens undoubtedly have cause to wave their state flag, each of the 50 states also has its share of less than brag-worthy traits. 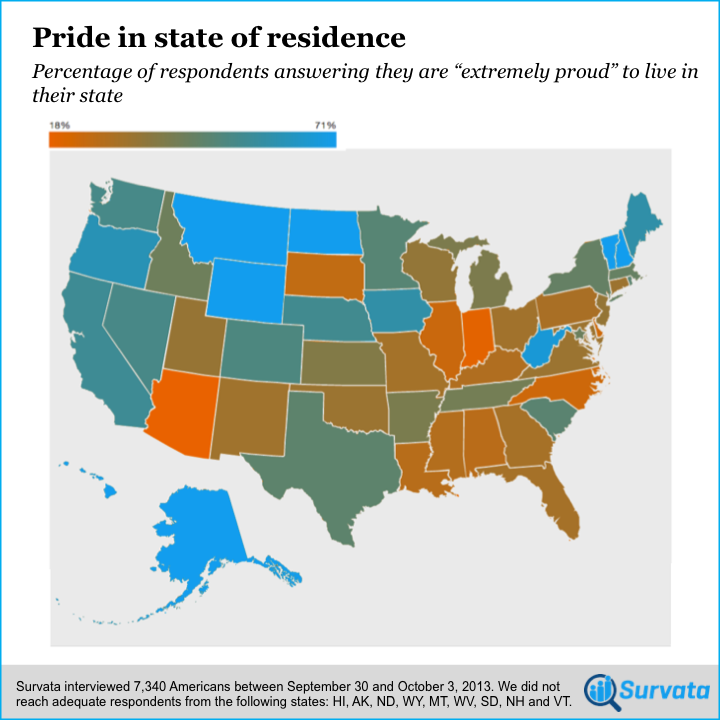 It's been shown that Americans have strong opinions about states beside their own, but we at Survata were curious how residents of a state feel about home sweet home. We used our consumer survey service to ask 7,340 respondents if they were proud to be from the state in which they reside. 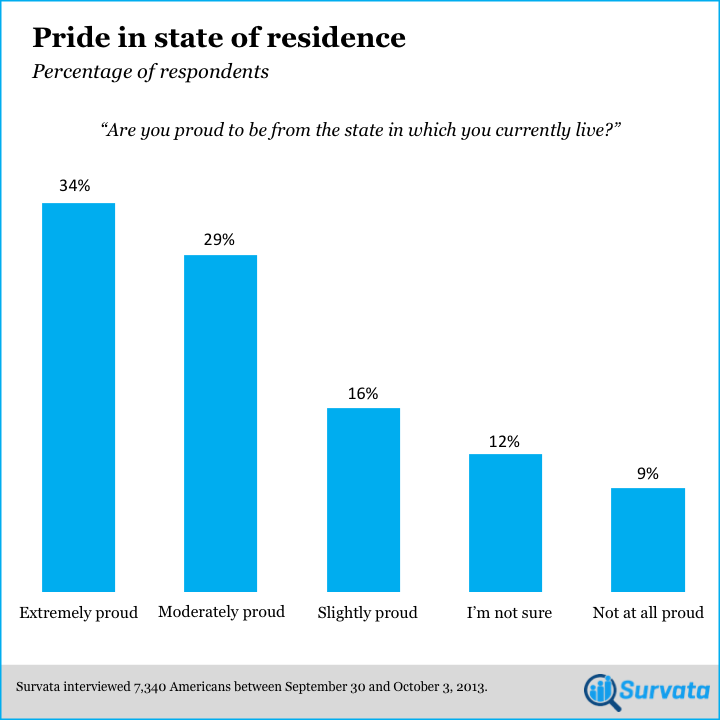 The results showed that 34% of respondents were "extremely proud" to be from the state in which they currently live, while 9% were "not at all proud." We found that Oregon, California, and Washington were among the proudest states, each with over 42% of respondents saying they were "extremely proud" to live there. Arizona, Indiana, and North Carolina were the least proud, as each state had less than 21% of respondents answer they were "extremely proud." Since Texas is known for its larger than life persona, we predicted that the former sovereign nation would produce extraordinary results in terms of state pride. However, Texas was towards the middle of the pack for both proud and not proud residents, recording the 20th highest total for rates of "extremely proud" residents (36%) and 19th highest for those who were "not at all proud" (12%). We also found gender differences among Texas respondents, as women were over twice as likely as men to say they are "not at all proud" of their state. Perhaps because they're unlikely to have much say in where they live, respondents age 13-17 were the age group most likely to answer that they are "not at all proud" to be from their state. 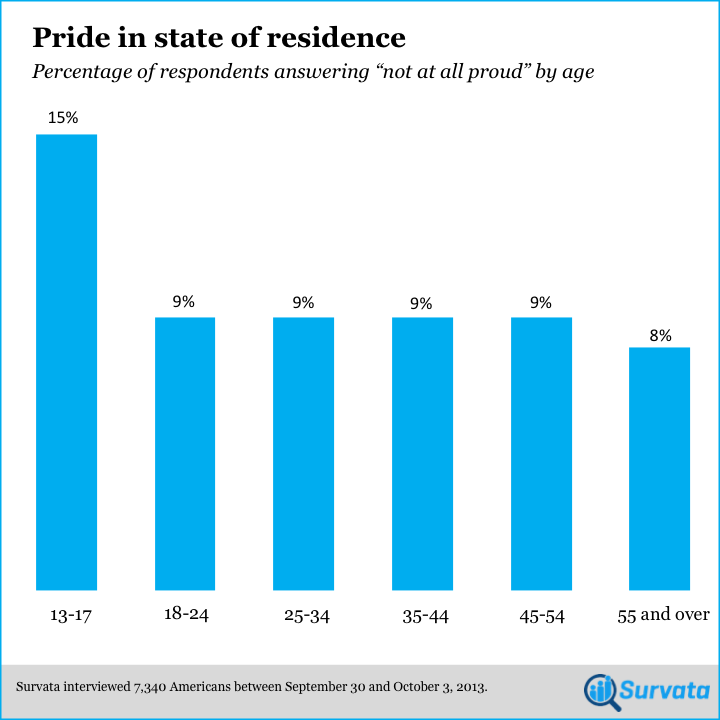 At 15%, teens were 67% more likely than respondents over age 18 not to take pride in their place of residence. We were struck by the fact that over a third of total respondents were "extremely proud" to be from their state, and will be curious to see how these totals fluctuate with any future political and economic changes. Want to poll the nation for answers of your own? Build a Survata survey in minutes. You can download the underlying data here. You can analyze the underlying data in Statwing.